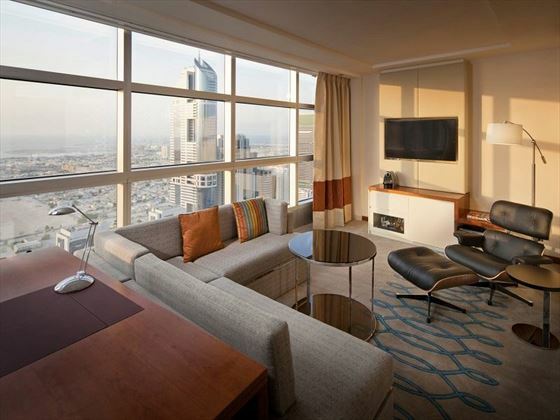 Jumeirah Emirates Towers is all about indulgence. 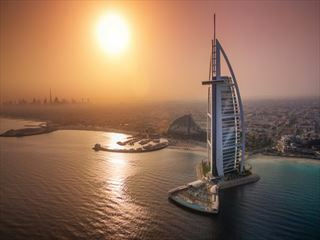 From the unlimited complimentary access to Wild Wadi Waterpark and Jumeirah’s private beach, to the first-class collection of award-winning restaurants, this glamorous resort truly takes care of its guests. Each of the 400 rooms and suites are sophisticated and relaxing, with amazing views of the city skyline from the floor-to-ceiling windows. Ranging from the smaller yet classy Deluxe Rooms, to the truly opulent two-storey Royal Suite, all feature lavish amenities and plenty of room to unwind. Female single travellers can even book themselves in to a Chopard Ladies Room, all of which are on a private floor, serviced only by female personnel. For the discerning gentleman who fancies reclining in a leather chair, sipping whisky and tucking into classic English fare, Alfie’s is a great spot to chill out. Meanwhile, The Rib Room will present you with a huge feast of sumptuous grilled meats, whilst Hakkasan offers award-winning Chinese cuisine. There’s 12 other restaurants and bars and try, and no matter where you choose to go, each day you’ll be presented with a taste sensation. You can spend your days as relaxed or as lively as you see fit. For those with itchy feet, take an amble through The Boulevard, full of couture shops and fancy designers, get your complimentary access to Wild Wadi to great use, or try out an aerobics class. If enjoying the easy life is more your thing, soak up the sun next to the expansive pool, or treat yourself to a revitalising facial at Talise Spa. Jumeirah Emirates Towers is located along the lively Sheikh Zayed Road, close by to Jumeirah’s stretch of golden sand beach. Transfer by car from Dubai Airport is just over 10 minutes. 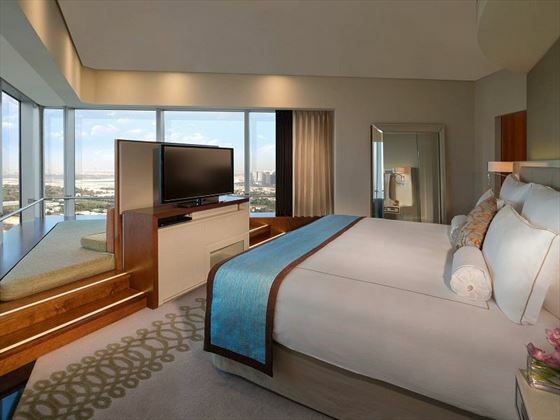 Deluxe Room – Modern 44sqm rooms featuring floor-to-ceiling views of the city skyline. Sleeps two adults and two children. 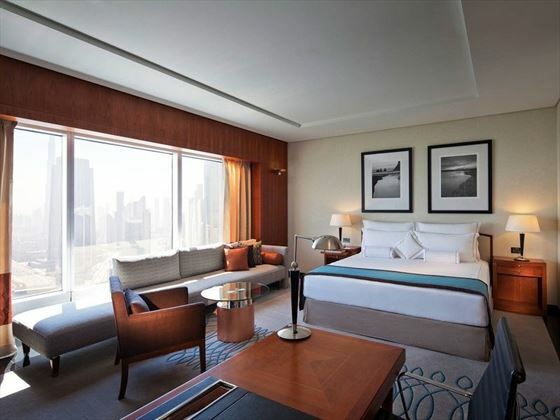 Premier Deluxe Room – Contemporary 44sqm rooms with a plush king size bed that looks out onto the city skyline. These rooms are located on a higher floor for an even more stand-out view. Buffet breakfast at Mundo Restaurant is also included in the room rate. Sleeps two adults and two children, or three adults and one child. Chopard Ladies Room – Unique 44sqm rooms found on one floor only, and serviced by female personnel. This is ideal for executive women looking for luxury and sophistication, with its private cosmetic refrigerator and marble bath for pampering. Sleeps two adults and one child. Club Room – Nestled on a high floor, the city views from these 44sqm rooms are phenomenal. The Club Rooms are chic and offer additional luxury amenities, including a large media hub and exclusive access to the Club Executive Lounge where you can enjoy breakfast, afternoon refreshments and happy hour. Children are welcome in the Club Executive Lounge too. Sleeps two adults and two children, or three adults and one child. Club Junior Suite – Located between floors 42 to 48, the city views from these 63sqm suites are stunning. Featuring a separate living area and wonderful floor-to-ceiling windows. Guests also receive complimentary access to the Club Executive Lounge. Sleeps two adults and two children, or three adults and one child. Executive Tower Suite – Found on the upper floors, these gorgeous 87sqm suites can be interconnected with a Deluxe Room, Premium Deluxe Room, Club Room or Club Junior Suite. Featuring a work space and a separate sleeping area, plus a dining table and exclusive access to the Club Executive Lounge. Sleeps two adults and two children, or three adults and one child. Presidential Suite – Exceedingly luxurious 225sqm suites offering three different opulent designs: Modern Scandinavian, Louis XVI, and Versace. Each suite’s décor oozes glamour, and all feature a separate living room and dining room, personalised butler service, two bedrooms, and even a private Jacuzzi. Guests also receive complimentary access to the Club Executive Lounge. Sleeps four adults and two children. Royal Suite – This is the most indulgent suite in the resort. 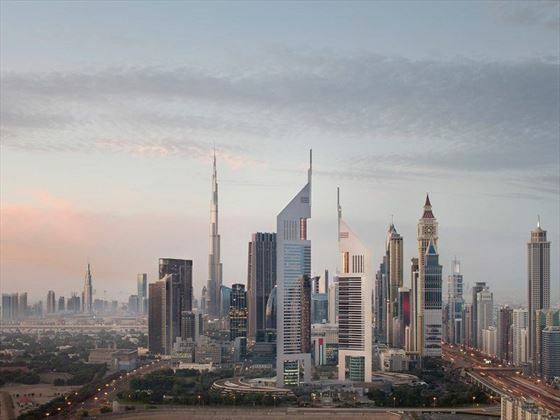 The 312sqm of space span two storeys, featuring three Arabian styled bedrooms – each with their own jacuzzi and dressing room, a private butler service, dedicated areas to relax and entertain, and complimentary access to the Club Executive Lounge. Sleeps six adults and three children. 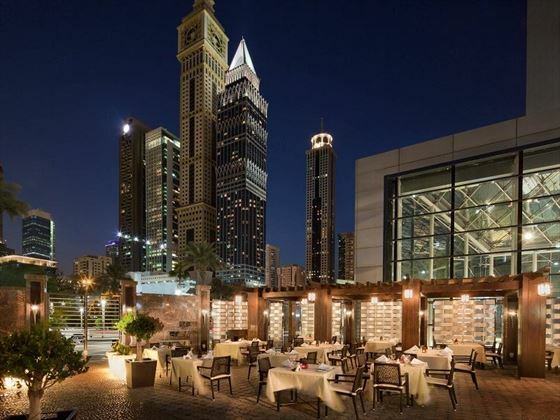 Mundo – Take yourself on a culinary journey around the globe at Mundo, a chic international restaurant with favourites from the Mediterranean, India, Middle East and Asia for breakfast and lunch. Opening times: Sunday-Thursday 6am-11am and 12.30pm-3pm. Friday 6am-11.30am. Saturday 6am-11.30am and 1pm-3pm. Dress code: Casual. Alfie’s – A sophisticated restaurant located in The Boulevard, created for men with a taste for finer things. 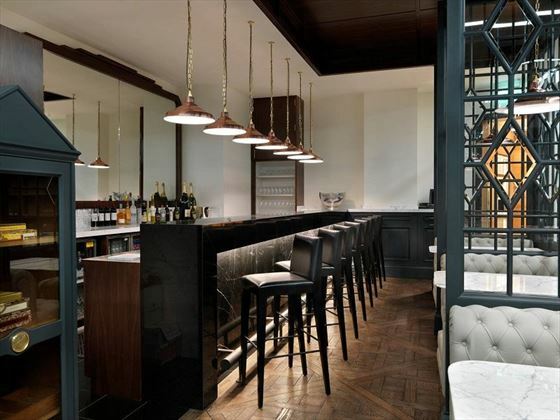 Sink into one of the plush leather chairs and dine on sumptuous British fare, sipping your favourite cocktail. Opening times: 12pm-12am daily. Dress code: Casual. The Rib Room – Meat lovers won’t be able to resist this flavoursome restaurant, cooking your favourite grilled meats to your exact taste. Tuck into ribs covered in sticky BBQ sauce, or indulge with a tender Chateaubriand before wandering out to The Rib Room Bar next door for an after-dinner tipple. Opening times: 6pm-11.15pm. Dress code: Smart casual. Daefli Lounge – The Bedouin inspired interiors will certainly entice you, and we have no doubt you’ll want to stay a while as you listen to soothing piano music and sip on traditional Moroccan teas and Turkish coffees. Opening times: 24 hours a day. Dress code: Casual. 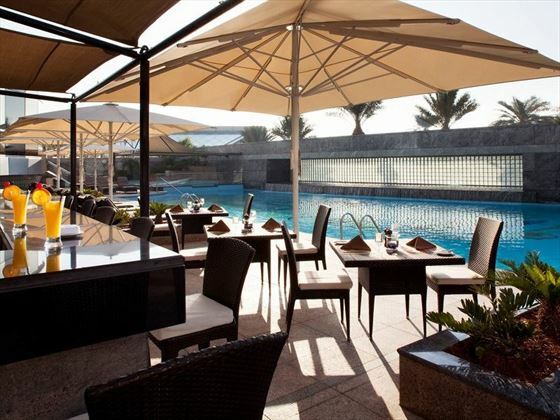 Pool Bar – Sip on a delightful cocktail or enjoy a quick pizza, salad or burger as you watch the sun set over this classy pool bar. Opening times: 8am-10pm daily. Dress code: Casual beach attire. La Cantine Du Faubourg – This is a truly unique dining experience, where you’ll be taken on a sensory journey of sound, music, image, art and food. This is trendy eating at its finest, best enjoyed in a secluded booth. Opening times: Weekdays 12pm-2am. Weekends 12pm-3am. Dress code: Smart casual. The Noodle House – Transport yourself to East Asia at this utterly charming restaurant, offering an open kitchen and a fusion of fast food and fine South East Asian dining. Treat yourself to a menu of Asian specialities, including Kung Pao noodles and duck and watermelon salad. Opening times: Sunday-Thursday 12pm-12am. Friday and Saturday 1pm-12am. Dress code: Casual. Hakkasan – The original Hakkasan restaurant was the first Chinese restaurant in Europe to gain a Michelin star, and this level of excellence has followed Hakkasan to Dubai. 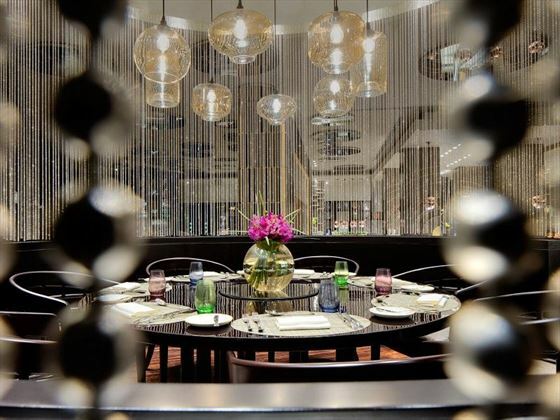 Dine on sumptuous Chinese cuisine whilst admiring the traditional décor, tucking into dim sum platters, crispy duck salad and Sanpei Chicken Clay Pot. Opening times: Monday-Sunday 6pm-12.30am. Friday Brunch 12pm-4pm. Bar 5pm-1.30am. Dress code: Smart Casual. Et Sushi – The bright and aromatic flavours of sashimi, Maki rolls and Nigiri Sushi at Et Sushi are unbelievably delicious. You could even perch yourself on the terrace and indulge with teppanyaki and Mochi ice cream. Opening times: Sunday-Saturday 12pm-12am. Dress code: Casual. 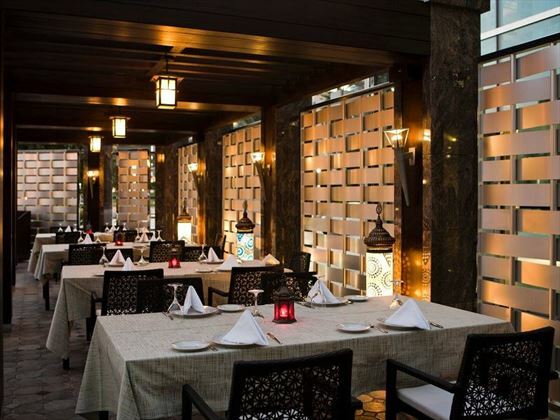 Al Nafoorah – The authentic Lebanese cuisine here is tantalising, paired well with live music and a warming atmosphere. The restaurant is in a secluded location, and offers incredible views from the terrace – ideal for a quiet dinner for two. Opening times: Sunday-Thursday 12pm-3.30pm and 6pm-11.30pm. Friday-Saturday 12pm-4pm and 6pm-11.30pm. Dress code: Smart casual. Flow – If you’re hoping for something more on the healthy side, Flow is perfect for you. The chefs mix fresh vegetables, fruits and meats to create a dynamic sharing-style menu full of nutrition and packed with flavour. Vegan, gluten-free, dairy-free and Paleo-friendly options make this a great restaurant for all tastes and needs. Opening times: Sunday-Thursday 7am-8pm. Friday-Saturday 9am-5pm. 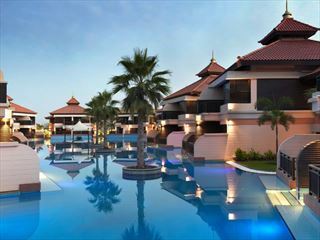 The resort has a beautiful pool area, with expansive terraces adorned with sun loungers and comfortable chairs. There’s also a covered children’s pool area, and a Jacuzzi. 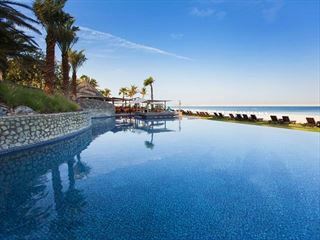 Guests receive unlimited complimentary access to Jumeirah’s private stretch of beach. Talise Spa – Escape from the bustling city and let your mind and body relax at Talise Spa. This is a beautiful tranquil retreat, offering a menu of luxurious treatments including signature facials, invigorating massages, and time spent in the floatation saltwater pool.